Who would wish back the smog that once notoriously shrouded London, masking the streets and allowing nefarious deeds to take place between the weak flickers of gas lamps? People following in the footsteps of London's most famous literary sleuth Sherlock Holmes of course. Those are the souls for whom the smog blanket would improve the chances of imagining the sound of a hansom cab or of almost catching sight of a crook's coat tails as he slips away back into the shadows. You may not have noticed it but London is one of the stars in the stories of Holmes, its streets and landmarks are more than a backdrop for events - they're more often key elements in the stories. Holmes stalks The Strand and has cause to visit the British Museum's Reading Room for research purposes (Adventure of Wisteria Lodge) and for investigating the goings on at the Museum Tavern (The Adventure of the Blue Carbuncle) across the road. He consulted Fleet Street hacks and Harley Street specialists and was also known for attending the opera in Covent Garden. He dines at Simpsons-in-the-Strand (The Adventure of the Dying Detective), frequents the Langham Hotel (The Sign of Four), Claridges (The Problem of Thor Bridge) and the Criterion Restaurant, which is where Dr. Watson first heard of him (A Study in Scarlet). Holmes' creator, Sir Arthur Conan Doyle, had Holmes spread out though the city hunting criminals, but he and Dr. Watson had hansom cabs to help them so you can't expect to see as much on foot, but all of the above are within easy walking distance, with the opportunity to go via The Charing Cross Hotel (The Adventure of the Bruce-Partington Plans) and the Sherlock Holmes Pub – (when it appeared in 'The Noble Batchelors' it had a different name). This pub is now Holmes themed from the duo's replica sitting room to a stuffed 'Hound of the Baskervilles' – they purchased the collection from one amassed for the 1957 Festival of Britain. 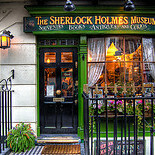 It's elementary that all Holmes walks must begin or end at 221b Baker Street, the address shared by Holmes and Watson between 1881-1904, if Sir Arthur Conan Doyle is to be believed. The 'b' was pure invention, and the Georgian building, now a Holmes museum, is actually located between 237 and 241 Baker St., but this house was used as a lodging house up until 1936, which means that its layout is similar to that described by Doyle. It's been Victorian-ised, and the large first floor front room converted into the sitting room so many Holmes related games are afoot from.